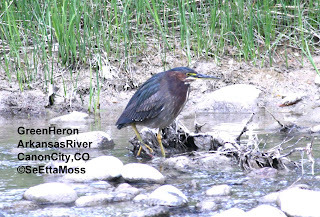 The Green Heron in the top pic was feeding at the outfall of a stormwater pipe where it flows into the Arkansas River across from the Canon City, CO Riverwalk. There were also several Yellow-rumped Warblers feeding by sallying and even picking insects from the rocks at this same outfall. The Olive-sided Flycatcher was next to the Riverwalk bluff trail. And the Indigo Bunting was in the same area. 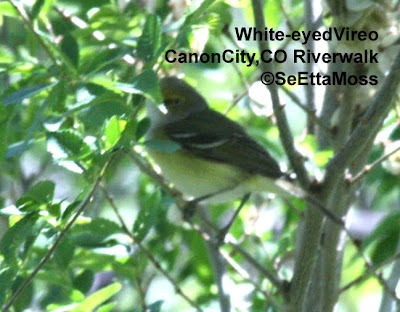 Here are two more pics of the White-eyed Vireo I found on the Canon City, CO Riverwalk yesterday. Both of these pics show the whitish throat and yellowish wash on it's flanks found on this species. 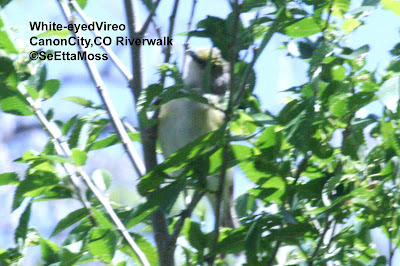 I found this White-eyed Vireo yesterday on the Canon City, CO Riverwalk. They are very rare birds in this part of Colorado. Though I see lots of them when I travel to So Texas, this is the first one I have seen not only on the Riverwalk but anywhere in Fremont County. The top pic shows the very distinctive white iris. 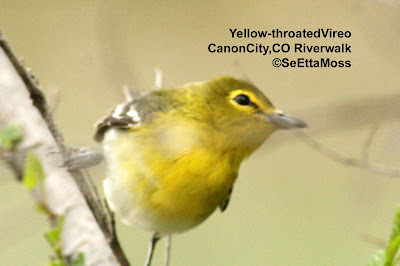 I found this beautiful Yellow-throated Vireo on the Canon City, CO Riverwalk this afternoon. A rare visitor here, it was busy foraging on an unusually cool (mid 40's) and very cloudy day for this area. I found this male Yellow Warbler on Saturday on the Canon City, CO Riverwalk as it got a few songs out in between mouthfuls of food. 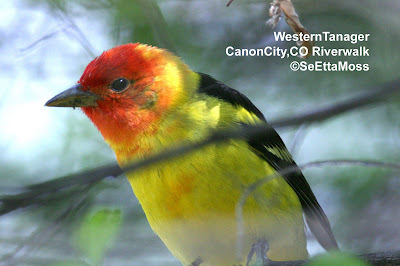 It was a very busy day on the Riverwalk so this warbler may have just arrived. 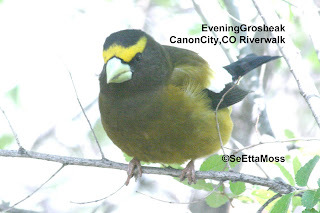 Evening Grosbeak can be heard calling, loudly, in the background SeEttaSorry that the pictures jiggles a little but if you have ever followed a warbler with binoculars you know it is a challenge to keep up with their almost constant movement and I am hand-holding the camcorder (I can't imagine how one could put the camcorder on a tripod because of the difficulty tracking them). If the picture is black, just click on the start button on the bottom right of the screen.